It is a fantastic way to communicate with a group of likeminded individuals and, as each event tends to be well-targeted at a specific demographic, picking the right event means that marketers can make sure they are communicating with the right kind of people. To stand out many brands are turning to experiential in order to give people something to talk about. Adidas recently caught our eye with this interesting activation at the Santiago de Chile International Marathon. 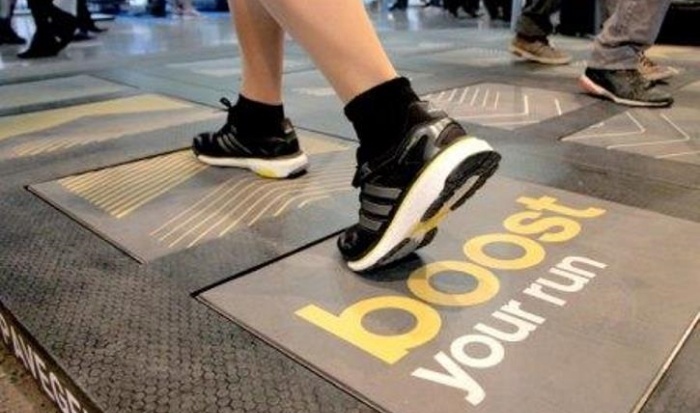 In order to promote its “Energy Boost” trainers, a product positioned as a revolution in running that will “change your run forever”, the sports brand created a platform that harvested the energy from the footsteps of the participants. This energy was then used to power a large screen that displayed messages of goodwill from the friends and family of the runners. Because business director, Joss Davidge, looked at Nike’s Cheer Me On last year, for his regular blog for the Marketing Society, which used RFID technology to connect with marathon runners. Here is an example of a non-sports brand using experiential marketing to drive home a message at a sports event. Asics challenged people to run against Ryan Hall in the lead up to the New York Marathon and here is a little plug for our recent campaign with Betway, which set out to connect with mud-runners by providing a service at a time of need.